This was our second investigation in Colchester of the week as we had been at The Town Hall the night before and were hoping that the spirits would make themselves known in the Hotel. We split everyone into 4 groups and each group headed off to a different area with different team members. I chose the cellar as always because some things happen here which do not happen anywhere else in the hotel. There was only really one spirit in the cellar, his name was Michael and he was a Dray man (he delivered ale and beer from the local brewery). He fell to his death at The Red Lion hotel (although it wasn’t called that then) in 1833 by falling down the keg drop and breaking his neck. This wasn’t the only spirit that made an appearance although Michael was the most prominent or the strongest energy. There were also other male spirits who lurked in the background and a couple of female spirits who made themselves known to different people. All but the last group to the cellar there was lots of arm movement on command, with the arms of people being lifted when they thought nothing was going to happen to them, people being pushed and swayed on their feet much to their surprise and amazement. Some of the guests saw what they thought were people lurking in the shadows, or people watching them. Plus every so often one of the grates of the keg drop is loose so when people on the high street walked on it, it made a very loud bang. This didn’t help with people’s nerves, especially when they were standing closer to it! There were also many strange noises and whispers heard by some people but not everyone, although those that heard the sounds could not always say in which direction the sound came from. In the second group there was a male guest who said that he felt petrified, he didn’t know why but he was afraid of something, this was apparently very uncharacteristic of him as he usually wasn’t scared of anything. After the session had ended he went outside and when he came back in he felt fine. The last group didn’t want to be moved and every time someone walked on the grate several people screamed and jumped. However another male guest in this group during the course of the séance started acting in an aggressive manner and when I looked at him he didn’t look himself and looked very angry and had the face of someone who wanted to fight. He also reported that he felt very cold and at one point unable to stand properly. I felt that had the conditions have been right he (the guest) would have gone into a trance to allow the spirit to talk, however I also felt that it wasn’t safe to do so. After I placed this guest in the centre of the circle he regained his normal look and stance and told me what he felt, although he didn’t know why he felt so aggressive. We have held numerous ghost hunts at the Red Lion Hotel and I have held many séances in the cellar, but never has a person felt aggressive for no reason or been affected by spirit in this way, let alone two people in different groups behaving in similar ways. Once again a very enjoyable ghost hunt that many people had paranormal encounters and experiences that they weren’t expecting. This was an unplanned event, this was a last minute decision to come to the Red Lion, but since there was a small amount of guests we were hopeful that we would have some interesting episodes. We normally also film events here, but on this particular event we didn’t and from experience we know that when we don’t film something interesting happens that we wished we filmed! Both groups to the cellar felt the spirit energies of; Alex, a well-dressed man, a true gent from the 1800’s and Felicity who was a shy Victorian dressed woman. However the first group experienced lots more arm movement (all on command) as the spirit tried to move each person one by one, their hands lifted and usually hung mid-air. Most people felt cold spots near or beside them and others felt their heads being touched. A couple of people heard some odd noises and towards the end of the session I and others heard a voice, it sounded like a question and it sounded like it was in the room with us. There is a newsagent shop above this cellar but the normal muffled voices didn’t sound like what I heard, if only we had videoed the session then I would have been able to listen to the volume of the sound! As we finished the session there was a girl spirit who wanted some help, she was about 7 or 8 years old and she was looking for her nanny. Jason went back in the lower part of the cellar on his own and asked this girl to touch his hand. He felt some odd sensations and something that he described as a dog brushing past him. Later when we were in the Restaurant doing a Ouija board session we had a boy called Timothy who like to play in this space. He was 6 years old but could not spell nor able to tell us the year he passed. All in all this was a very enjoyable ghost hunt and some excellent paranormal evidence was witnessed by the guests. Being a Friday night, yes Friday the thirteenth we were hopeful for some great activity, we really wanted the episode with the light bulb to happen again. The light bulb incident happened on a private Hen night ghost hunt in January at the Red Lion Hotel. A group were sitting in the Restaurant to start to use a Ouija board when we all heard a metal “ping” sound and then one of the light bulbs from the chandelier fell and landing on the lap of someone participating in the Ouija board session. What was noteworthy is that the light bulb in question was a bayonet type bulb, which means it has to be pushed down and twisted before it comes out and that the bulb was undamaged and worked perfectly afterwards. There were less guests than a normal ghost hunt at the Red Lion Hotel so the plan was to hold four sessions with guests. Both my sessions in the cellar we were joined by a familiar spirit, a drayman, Michael about 57 years old and from a time when the hotel was a very busy place. We were also joined by a shy female spirit energy who did not give her name. She was dressed in Victorian clothing and seemed to be a Lady. Most of the guests felt their arms being moved on command when we were holding a séance. Some guests also felt cold spots and heard odd noises. On one occasion I asked for spirit to make a noise and immediately we heard a very loud noise, it wasn’t anything paranormal, as it was from the high street, but just happened at the very point that I asked for it. When I asked for the spirit to push or move people, the spirits obliged and several people were pushed, swayed and pulled backwards. The following two sessions I held tech sessions in room 7. These sessions I used lots of our electronic ghost hunting equipment like KII meters, Ghost Pro meters, a Mel meter and a Spirit Box. Both sessions we have lots of KII and communication via the Ghost Pro meters, plus fluctuations on the Mel meter, both in terms of electromagnetic energy and temperature. The first group however everyone’s Christian name was spoken or repeated via the Spirit box, along with many different answers to the questions asked. These answers were immediate; sometimes before the person asking the question had finished asking! With the second group the spirit only spoke one name; Dean and a few answers to questions. This was a very enjoyable ghost hunt and we look forward to returning over the coming months. Group B – With my first group we started by using the rods & pendulums, and some guests had movement to their surprise and were able to ask the spirits some questions. We had two spirits with us – male & female. Whilst I was standing between bed & window I had an odd feeling, felt I was being pushed too. Asking the rods to point where the spirit was standing they pointed to that area. Others stood in that area and felt it too. Whilst trying the scrying the guests were seeing a male face each time, but was also seeing their face disappear too. One guest was feeling a strong pressure to his lower back, and then suddenly it went. With the glass work, the glass started moving around the table slowly at first. We asked spirit to move the glass towards the torch for yes if willing to answer some questions, and away for no. We established this was a female spirit, who I had met here before. I asked her to draw her first initial, which seemed to resemble an I or A. I think it may have been Alice with us. Knowing Alice likes to move the glass a lot I asked a guest to think in his head, whilst he wasn’t touching the glass, for Alice to take the glass to a certain person. The glass moved to where he was thinking. Again he asked again, and the glass moved correctly again. We then asked Alice to draw a big circle around the table which she did. The glass stopped moving, so we were asking out to spirit to do other things in the room, like make a noise, move something, and two guests sitting on the bed felt like someone sat down behind them, no-one did, and another guest who had her foot slightly under the bed felt it go down on her foot. We were also hearing noises in the corridor, but when we opened the bedroom door we heard nothing more. Group A – My first session with group A we started by using the rods & pendulums. Many were familiar with communicating with spirit and got answers to many questions. We had a male and female spirit with us. We tried some scrying and again they were seeing male and female faces, glasses, and moustache and dark eyebrows. When Chris (guest) sat in front of the mirror, he started swaying back and forth. His breathing started getting very heavy. Asking if he was okay we had no answer. Spirit had stepped a little close and was preventing him to respond. I put my hand on his back and asked spirit to step away, calling Chris’s name several times before he was back with us. He could hear us, and felt my hand but felt distant. Helen, another guest, tried and again she went into a trance but this is something she had done before and didn’t mind. We then tried some glass work, and the glass started moving immediately. We had a male spirit with us but seemed reluctant to answer any questions at first. He had been murdered within the last 50 years. Had visited Colchester when alive, and had been married with a child. Chris kept getting the name James, Helen had the initial J but thought Jack, I then had the name Emma. Spirit confirmed he was called James, his wife Emma and his son was Jack. We asked if it was James that had affect Chris, but no it was another spirit, asking if we should be wary of that spirit the glass answered yes. One guest on the bed kept feeling her hair being touched, asking spirit to take the glass to where he was standing and the glass moved to that person. Asking spirit to make a movement on the bed, before I had finished saying it, the guest felt someone sit down on the bed behind her. Asking spirit how they passed, one guest felt a sharp pain on her head. Asking spirit if that was how he died, answered yes. We then asked spirit if he had enjoyed being in Colchester when he was alive – yes. He had had some fun times here. Him and his family had passed to the light, and the person that had murdered them all had been punished. The guests did ask spirit to move the glass while they wern’t touching it, although it didn’t move, whilst their hands were touching the table they did feel the table move. Group B – We initially started with Ouija and table tipping but had no movement. I then split the group with three trying table tipping and three with the writing planchette. The table did started moving, and the writing planchette was also moving slightly. All guests then switched back to the table tipping, which lifted up a few times. We then tried the Ouija again and received the letters T and G for the spirits name, and age 6. We were feeling cold spots around us, on our hands, and also on the empty chair at the table too. Did try table tipping again, and it did lift up and try to spin a little too. Group A – Starting with the Ouija the spirits that came through were all connected to those sitting at the table. First we had Chris’s Granddad called Pat aged 75 and had passed 1 year ago. Chris was able to receive some lovely messages. Then the glass spelled Jennifer which was Chris’ Nan. Then the glass spelled Tony age 52 and knew Helen, this was an old customer from when she worked in a pub. Then an Aunt came through for Marc. We then tried some table tipping, and straight away we had lots of movement, rocking, spinning, with many random unexpected twists and turns. With the writing planchette they had one big curve, similar to the letter C.
A great night with such lovely guests making the evening truly entertaining – thank you! Group D – We started with scrying in room 6, and instantly guests that were taking it in turns to sit in front of the mirror and those standing behind were seeing an older man, moustache and beard, droopy eyes and cheeks, and whilst the first lady was wearing glasses everyone saw them disappear. Some were seeing icy blue eyes. One guest felt a cold breeze past her face but nobody moved to cause it. We then moved to room 7 to use the rods & pendulums so we could connect with the spirit more, and everyone had movement. However just before this, whilst standing in the room, some heard a noise on the bed, similar to someone sitting down on the bed. Some sat on the bed and it felt cold in the middle, and they were feeling movement or vibrations next to them. We asked spirit to point all the rods (four of us holding them) to wear the spirit was, and all pointed to the middle of the bed. We then heard scratching on the wood at the bottom of the bed. One guest sitting on the bed asked spirit to touch her, the rods moved round to touch her. When we all asked spirit the same questions we were all getting the same answer on our rods & pendulums. One guest (Sam) her pendulum was moving very erratically, large fast circles, but her arm was totally still. She was feeling a static energy going up her leg and through the arm she was holding the pendulum. Then shortly after it was completely still. Group E – Started with scrying and again were seeing an older man with a beard and moustache. One guest was suddenly surprised to see the face go dark and the eyes bright white with dark circles around them. The eyes seemed to be looking straight at her which unnerved her slightly. Then the face seemed to change to a boy then a young male. When using the pendulums/rods the spirit said he was from 1700’s, age 40, married and lived in Essex. One guest noticed whilst holding the pendulum, each time she moved the pendulum towards her very slowly, the pendulum swayed away from her. Group F – Again started with the scrying and were seeing an older man with a beard. He had grey bushy eyebrows and a dark moustache. Initially the moustache was described like hitler’s, but then started drooping down the sides. The eyes were flashing bright green and white every so often. Almost witch like. Then the face started drooping on the left side, then on the right side. One guest sitting in front of the mirror was feeling very tingly on her face. The forehead suddenly seemed very large then disappeared. One guest felt very sad, wanting to cry. In room 7, whilst using the rods & pendulums, it seemed the spirit of Alice was with us. She answered questions, one being that this was the room she died in. Asking to point the rods to where she was standing, all pointed to the door. Group A – Again in the mirror all were seeing an older male with a beard and a moustache. White eyes too. One guest thought she saw a woman wearing something on her head that made her look like a nun. In room 7 everyone had their rods & pendulums moving, the rods pointing to the window this time to show where Alice was standing. Asking if her killer was in the room with us now, answered yes. Asked to point rods to wear he was standing and they all pointed to the door. One guest asked for his name and got William in his head. Asking the pendulum to confirm this was correct – yes. Group B – Again in the mirror we were seeing an older man, described similar as before, then suddenly we saw what looked like a nun. In room 7 we had Alice with us again, and asking to point the rods to where she was standing they pointed to between the two chairs the two ladies were sitting in. We then heard a noise in the bathroom, the door being open, and asked spirit to point the rods to where they had made a noise and they pointed to the bathroom. Asking spirit to point the rods to where they were going to make a noise next, they pointed to the bed, but we didn’t hear a noise. Group C – With our last group of the night, we again started with scrying. Some being slightly sceptical saying our eyes are seeing things, but were surprised when they started seeing the face changing. They were again seeing an older male, described similar to the previous sessions. We then moved to room 7 and used the rods & pendulums to communicate with spirit. Again we had Alice with us, saying she was pregnant by the Judge, who had killed her by beating her to death. Two guests had decided to stay in room 6, and using a a mug turned upside down on a small table they tried some glass/mug work. They had a male spirit called Hugh, who didn’t like women. The mug continued to moved around the table, with just the two of them touching, even with their fingers turned nail side down. They were very surprised it even worked with a mug! 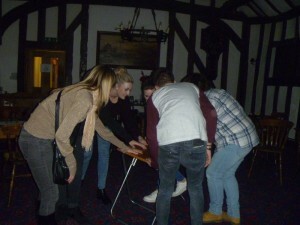 Group C – I started by showing the guests how to use the rods & pendulums – which to their surprise they started moving. One guest in particular was amazed by the way his pendulum was moving. He asked spirit to show him the movement for yes & no, and was able to identify it was a male spirit. Others were getting movement too. By asking spirit if they wanted to do some glasswork with us, the pendulums/rods were showing a yes. Everyone all put their fingers on the glass and it started moving immediately. With encouragement from guests the glass started moving stronger. The spirit did not want to answer questions so instead just seemed to play with us. The guests took it in turns to ask in their head (inc 2 guests not on the glass) for spirit to do something with the glass ie. draw a shape/letter/number, or move the glass to a particular place on the table. Each time to everyone’s amazement the glass moved exactly how they asked. They also took it in turns to remove their fingers off the glass until just one left, and the glass would still move. They then placed their fingers on the glass nail side down – and it was still moving! Twisting too at request. I did want to find out which spirit was with us, and spirit confirmed it was Alice, and the other two spirits in the room were the Judge and his son, the son had accidently died in the hotel. I also wanted the guests to stand in the small corridor joining rooms 9 & 10, with both the doors closed. All hearing footsteps in room 9 and when checking no-one there. Also two guests noticed whilst standing there, after their eyes adjusted and could see a little, it suddenly went very dark. We did turn on the spirit box and “yes” was heard twice in response to a question. Some guests were sensing where spirit were, and when taking photos of that area would capture light anomalies. Group A – Again we started with the rods & pendulums, and many had movement. We then tried some glasswork, and the glass started moving immediately. Sprit confirmed again it was Alice, one of three spirits with us. The glass was moving randomly across the table, again drawing shapes or letters that the guests were thinking. The glass continued to move with fingers touching nail side down, and also with just one person left touching. Then one guest with just her finger left on the glass felt her finger being moved on top of the glass. We all watched in surprise as this happened. Guests spent time in the corridor, hearing noises in room 9, and two guests whilst laying on the bed in room 9 heard a loud bang in that room. Kerry (team) joined one guest in the corridor and they experienced various touches on their knee, wrist and face, with the last touch happening to both of them in the same place. Group B – With the last group before the free sessions, again I started by showing the guests how to use the rods & pendulums. They had some movement. We then tried glasswork, and the glass was moving very differently – slow and unsure. The spirit confirmed it was a boy. With a lot of encouragement the glass moved to all four corners of the table as asked. And then drew circles as requested. Everyone did spend some time in the corridor and again footsteps and noises were heard in room 9, and when checking no-one was there. During the free session I joined the last remaining guests and team in the cellar for a ‘human pendulum’. Julie (guest) was a willing volunteer in the centre of the circle with Sue (team) directing. This was amazing to see, spirit moving Julie forward for ‘yes’ and to her left for a ‘no’. We established the spirit was a chef called Jacob who had died in a fire, which was started deliberately. Some team & guests had experienced this spirit earlier in the night. We all took it in turns to ask spirit questions. A great end to a truly memorable night – looking forward to the next one at The Red Lion! Group D – I started with explaining how to use the rods & pendulums and immediately we had lots of movement. We then asked spirit to show movement for yes & no answers, and guests were then able to find out what spirits they had with them, one of them being a male. Those people sitting on the bed felt the bed move, which has happened many times before in room 10. They were also looking at the light showing through under the door from the hallway, and could see a shadow which appeared to be moving. We were also hearing taps & creaks in a different places in the room. We tried fingers on the glass to see if spirit wanted to communicate this way, and after a couple of short movements, the spirit did answer by moving the glass to yes to being a male, but then no more. Then Ellen felt a touch on her face, looking to see if her friend’s hair had touched her, she was too far way but she had felt her hair being touched. At the same time I saw a flash of white light on the bed behind them. In this room there is a short corridor to room 9, and the guests took it in turns to stand here with both doors shut. They had similar experiences; touches, with noises and creaks in that area, and what sounded like movement in room 9 – no-one was in there. Also two guests had seen light coming from under the door, but then it disappeared and everything went very dark. Annette (guest) who was sitting on the bed could feel herself being pushed back. Group A – Started with rods & pendulums which moved immediately, guests then established their yes & no movements, and were able to ask spirit questions. We tried the glass work – but only slight movement. I then asked if anyone wanted to spend some time in the closed corridor, and the first two females after what seemed like less than a minute came rushing back out. They had both seen a face in front up them – they described it as being a face lit up under moonlight. The glass started moving around the table more, and answered yes to being male and a judge. Asking if he had been the face in the corridor, he answered yes. He then was unwilling to answer any more questions and just kept randomly moving the glass. However when he wanted to answer a question he would take the glass to one person in particular, and would then reply to his questions. We then realised our session had over-run by 10 mins and the glass returned to the centre of the table as if to say ‘goodbye’. Group B – Again started with rods & pendulums, and one person in particular, Hannah, had lots of movement with her pendulum. She was able to establish – sometimes with the pendulum answering yes or no, other times with thoughts in her head, the spirit was a boy age 7, called Percy. He was the oldest of four, had a brother called Jack, and two sisters called Penny & Molly. He lived in a house here before the hotel was built with his mother & father. There was a garden with flowers, and he liked climbing trees, but had fallen out before. His dad built houses, they had servants, and he didn’t like vegetables, but had birthday cake. We asked for him to jump on the bed, but he said no, saying he had something wrong with his leg. We asked how he passed, and he said he was poorly/sick, he had a bad head, and had died of a brain tumour. During this session two guests stood in the corridor, and were very alarmed when they heard footsteps in room 9 and the door handle turn. I suggested they go in that room, and whilst on the bed they saw the curtain move (no windows open and the radiator underneath was turned off) and they heard more noises around the room. Group C – Starting with rods & pendulums we had lots of movement. After establishing their yes & no’s, they asked if the spirit was Alice – yes. Whilst talking to Alice two male guests went to stand in the corridor, but came out extremely shaken saying “have any of you been walking around in room 9”. None of us had moved, and as it was now the free session I suggested they stay and experience the two rooms a little more. A fab night as always at the Red Lion, until next time….